Let me start by bringing you a classic video from the past: none other than Phil Fearon and Galaxy, “Everybody’s Laughing”. I remember listening to this a lot 20 years ago, it brings back memories. Enjoy! 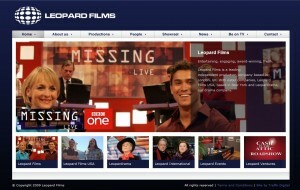 Until the 10th of April, I’m working every weekday at MTV Studios on Missing Live for BBC1. It’s a Leopard Films production with a bright and early call time of 05:30gmt. Leopard are the makers of Antiques Roadshow, Celebrtity Cash in the Attic, and more than I can remember. They’ve got a VERY up-to-date website, well worth checking out. I’m doing EVS on this production, which means everything that moves comes from me, on queue, and if it doesn’t we’re all in trouble (which hasn’t happened yet… let’s keep it that way). Keep watching every day at 09:15 and see if you know anyone we’re looking for. I’ve not had time to introduce this terriffic new site to the lineup, although it’s been going for almost four weeks now. In this very short time, we already gathered 133 followers on Twitter and have between 150 and 200 unique visitors per day. That’s without any marketing at all mind you! As the name suggests, the site syndicates news from all major football outlets (The Sun, Sky, BBC, Premierleague.com) and every Premier League Club that has an RSS feed. After a tough Saturday in MCR, the esteemed Reverend Andrew Toms esq. and myself teamed up for this joint venture to make the internet better. Why surf 10 websites, when all you want to read could be on a single one? It was all Andy’s idea really, after seeing how well Broadcast News works, and I can definitely say I wouldn’t have started it without him. We’re sharing responsibilities 50/50, with me taking the lead on all things technical and him doing most of the content admin. 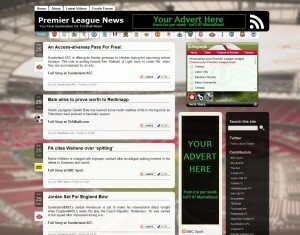 Have a look at www.premierleague-news.co.uk and let us know what you think, or drop us a tweet and follow @PremLeague_News. Future plans include getting rich through sponsorship, and adding a Wiki for all things routing to the site on a private section. Same concept as above, with focus on Celebrities and “V.I.P News”. Julia and I wanted to build a celebrtity related site, due to the overwhelming popularity of this subject, and the amount of available RSS Feeds. Not that I really want to know about Ally McBeal’s marriage to Indiana Jones, or how many articles on Jade Goody can be written in an hour (god rest her soul). The name came about while we were looking for suitable free domains for the project. All “Celebrity News” variants were taken, so we tried keyword suggestions – they usually never work, but sometimes come up with the funniest renditions. 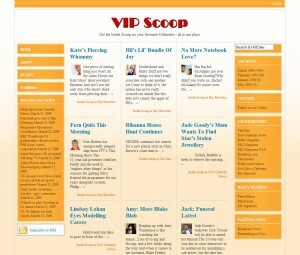 VIP Scoop sounds very cool, and for those not in the know, “scoop” is the new in-word for “inside news”. It’s hard to believe that VIP Scoop is even more successful than Premier League News, with close to 300 visitors a day and a whopping 356 Twitter followers. The site went live on the 9th of March, a week after Premier League News, and has only had a working theme since last weekend. I’m still working on a proper branding, but the fans love it already. Update: @VIP_Scoop now has a funky logo on Twitter! Still going strong, now with added JOBS section and Google Trends (find out what the world is googling for). I’ve been in touch with Grapevine Jobs and TVZ to syndicate more broadcast related jobs. Let’s see if I can get some RSS feeds from them. Broadcast Freelancer are re-designing their site and have kindly offered custom feeds for ours, and we’re all looking forward to the new layout and functionality. Big thanks to Wayne at Broadcast Freelancer! In addition, I’m very happy to announce our new New Zealand correspondent for the site: Justin Loza. He was kind enough to pass on some freelance job offers in the past, and he’s agreed to post every new job he finds directly onto the site. Thanks, Justin! Keep’em coming! If YOU have any broadcast related news that isn’t already in any of the magazines, drop me a line – or become an editor on the site! 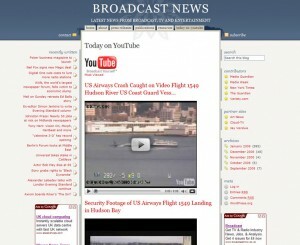 Visit www.broadcast-news.co.uk to see it all in action. Not so much a “website” as it is a helper layout for the London Creativity Collective. It’s a Facebook Group by my good friend Jerry Hyde, which accumulated over 500 members in the first 6 weeks of its launch. It’s even spawned a clone on Facebook. Pretty impressive, considering it came out of nowhere. I love that about the internet! One popular feature is the Thought of the Day, which used to be delivered every day via Facebook Mail. The trouble is that group members can’t easily opt-out of these emails, so I came up with a proper mailing list installation. Powered by phplist and WordPress, users can now sign up or unsubscribe without it affecting their group membership on Facebook. Nice! This project isn’t officially launched yet, but I’m meeting Jerry on Friday to talk it through. In the meantime, have a look at www.daily-thoughts.co.uk and try it out! WordPress Guru, a diary of web and php-related discoveries, like a “how-to” notebook on everything that gets in the way of having a good time hacking the web. I’m filming a lot of footage for Cloud-TV, which by the way needs a rebuild (the shopping cart isn’t working anymore). The plan is to turn it into a footage library for all things “clouds”. Again, give me time… there are now several terabytes of footage I need to wade through, HD and SD. Pinkstone Pictures – my broadcast related company site.. typical! The one thing that makes the most cash gets neglected! more Burger and Chips reviews right here – massive thanks to Ray Windust for some valuable contributions that I’ve not had time to post yet. They’re coming though! All in good time – stay tuned!